Want to see the latest technology without the cost of buying a headset? MindTrek VR is a videogame arcade where you wear virtual reality headsets and can play with friends. They’re based in Woburn and Marlborough, Massachusetts, with new sites coming in New Jersey and Philadelphia. It’s remarkable! I’ve been to several VR arcades that aren’t much more than cubicle walls and basic headsets, and whose games fail to impress. MindTrek VR is the first VR arcade that has wowed me. It has a well-designed professionally decorated lounge out front with lockers for your stuff. Then inside, you can pick from three experiences. First, the Gamer Lounge has rows of high-end videogame PCs where you can play Fortnite, Overwatch, Counter Strike, Call of Duty, and more, networked with your friends and sitting comfortably in lumbar support chairs. They also have couches with console games. Second, the location in Woburn has a small VR “escape room” where you mostly stand in place, and a “free roam arena” where you can really walk around. 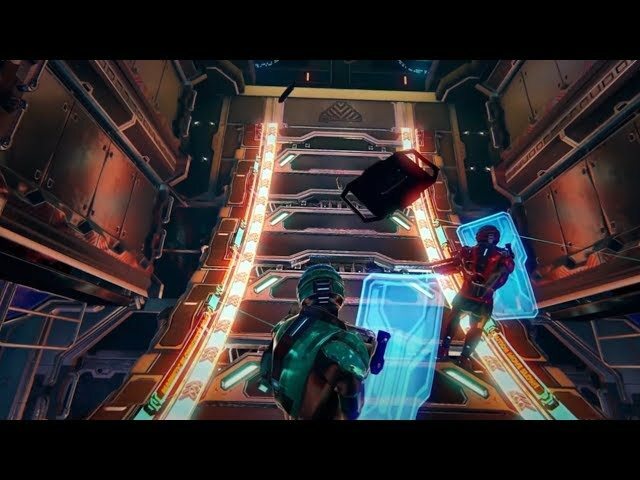 The free roam arena is the future of VR gaming! It’s a square, more than 60′ on a side, that contains two separate arenas where teams of up to 8 people can play together. You put on a backpack and VR goggles from Zero Latency, an Australian company, that work wirelessly. So there’s no tether from your headset to a computer, freeing up your motion dramatically. In the ceiling, 128 cameras watch the action and ensure that no matter where you look, you see the right thing in the virtual space. You really do feel immersed and can walk around the space as though walking a virtual world. The goggles don’t let out the heat from your head very well, even though they contain fans. So expect to sweat, but MindTrek replaces the mask’s inner foam with every use to keep it sanitary. Pro tip: dress light, with flat shoes, and book your time in advance. You pick from five different games, and play either 15 or 30 minutes. Some of the games are leisurely, and allow you to explore. 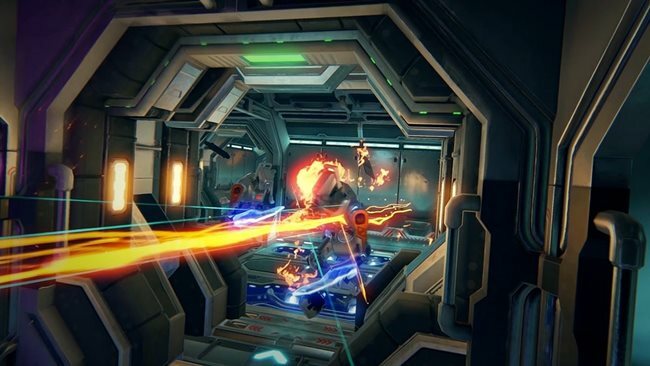 Others need you to stay on your toes and Sol Raiders even lets you shoot your friends. First we tried Engineerium, a good game just to get used to VR and enjoy the experience, because I don’t think you can die. You pretend to walk around a word of floating platforms, gathering up glowing orbs. The immersive illusion is so compelling that you quickly believe the sharp drops and heights around you. Sometimes you get the illusion of walking straight up a wall. Pro tip: it’s okay to close your eyes and ground yourself, remembering that you are still in a games arcade. I found myself lifting up my goggles occasionally to ward off panic. The games are designed so that you never come too close to a wall, or to your fellow player. Nobody wants a collision! If you do approach a wall, a warning will sound, and staff are alert to your situation as well. They will shut down the game if you go out of bounds. The illusion is fascinating and worth the experience just to look around, even if there were no game. 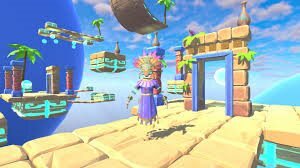 The floating platforms that you stand on move around in the air, which is a brilliant way to make it feel like you are exploring an endless space even though the real-world space is of course limited. At times you will even seem to be very distant or even upside down compared to your partner. Pro tip: wear contact lenses, although the Zero Latency unit has an adjustable focus on each eye, so that if you only bring glasses you won’t need them. The experience does have some minor flaws. Our experience with ziplines is that staff just adjust the straps for you. It takes just a second and tourists are pretty clueless. At MindTrek, teaching us to adjust our straps left us doing it wrong. One of the lenses in my VR headset was scratched, and around its periphery the view was blurry. So you don’t get much peripheral vision. When I moved my head quickly, the virtual world did take a split second to catch up to where I was looking. However, I did not feel nausea at any point in the experience. 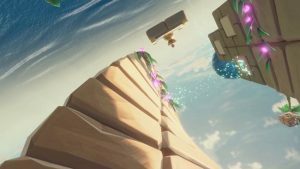 I’m told that no one has yet been seriously injured, but you could definitely trip and fall, especially if you’re playing a game that requires you to dodge projectiles, or a game where you must look all around and up and down for enemies, or a game where you move quickly. The floor is not padded, though the support columns are. I liked the experiences where I could walk straight ahead or walk straight “up” a wall. The corkscrew bridges seemed less safe to me, because it’s natural to start to lean left or right to “compensate”, taking you off balance. Engineerium was the perfect starter VR experience. Then we got fake guns for Singularity, an outer space adventure where you fight the AI who’s taken over your spaceship. Similar to Engineerium, platforms move and corridors adjust to keep you within the bounds of the physical place space. The action was must faster, though. We enjoyed shooting at flying robots all around us, exploring space ship passageways, and getting shot at. We had a great time and ultimately did save the day, though you’ll need far more physicality with this game. I wasn’t quite comfortable walking quickly and dodging. I also felt too tall to crouch behind virtual boxes for cover. I can’t be crouching and standing, crouching and standing. This game would be better I think with several people. With just two of us, it didn’t seem to scale down the action, so we spent much of the game overwhelmed. We needed to look behind and around us constantly, and got killed a lot. I must have died 30 times in 30 minutes. A sensor telling you when something’s behind you might have been nice. We would have liked more training time with the guns, which were complicated. Despite these rough edges, this was by far the most sensational VR experience that we’d ever had, a nearly perfect immersive adventure. We were glad that the live human operators watched over us, giving advice and noticing when one of our guns wasn’t aiming well. We were especially impressed with how far you could walk in VR and how long the games lasted. We did two in succession for a total of 45 minutes! Walking with tension and strange poses is more draining than you expect. Afterwards, you will need to sit for a moment. If this image is visually overwhelming, imagine walking through it for 30 minutes while machines attach you! 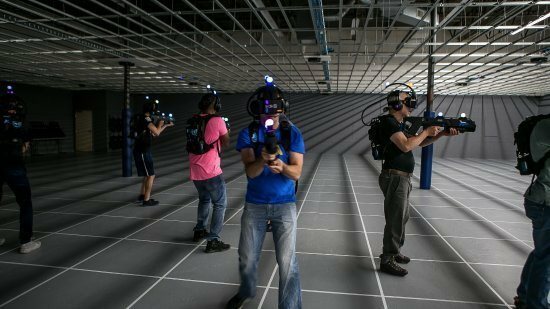 The MindTrek location in Woburn also has an older VR experience with HTC Vive headsets, the Escape Room. Here you are limited to quite a small space, a 15’x15′ arena where up to four people can play, each in their own quadrant of 7’x7′. The HTC Vive comes with controller you hold in your hands, which you use to pick up objects in the virtual space. Wearing glasses under the HTC Vive was uncomfortable, but the headsets had better peripheral vision than the Zero Latency. We did get slightly nauseous from tiny mismatches between our inner sense of head orientation and the virtual world shown, but only enough to notice it, not enough to stop the fun. Outside, spectators can watch the action live or on monitors showing the view of every player. The Escape Room is not really an escape room, since you are not placed into a virtual room, and there is no real storyline to give you context for solving clues. Instead you are given several puzzles to solve, such as making a tower from virtual cubes. The puzzles tended to be geometric, with blocky and even two-dimensional virtual objects, feeling a bit dated by videogame standards. As I’ve complained at other escape rooms, about half the challenge was figuring out what we were supposed to do, and that can be frustrating rather than fun. (I have a pile of virtual sticks. Now what?) You’re just randomly trying stuff in a state of confusion. However, with a clue from the game, or from our live human supervisor, once we knew what to do, it was great fun to perform the tasks. It was hard at times to hear our live supervisor over the noise coming from the free roam arena next door. You do the same puzzle as everyone else in your group, so you can race to beat each other, and sometimes can work together. The controls were sometimes easy to use and sometimes we wished our live operator had noticed our fumbling and given us more assistance. MindTrek VR is a world-leading facility that has only been open for 17 months. Surely they will polish the rough edges and their videogame partners will tweak the games. We were thrilled to find that you can just relax in the lobby or Gamer Lounge, and hopefully they’ll add physical arcade games for people unfamiliar with console gaming. They should either add a cafe or snack bar, or partner with a restaurant that has extra space for an arena. 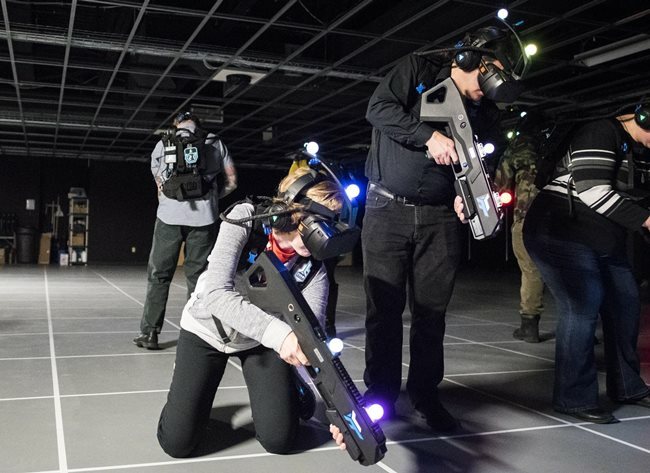 Of course you can rent MindTrek VR for private parties or corporate outings. They also have “boot camps”, a multi-day experience where you learn how to play and have fun practicing.